If they won’t let us into institutions of higher learning, we’ll build our own. 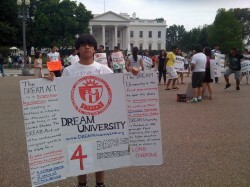 Left out of higher education and locked out of financial aid, undocumented youth from all over the country are convening in front of the White House this week to seek an education at DREAM University. Only five days in existence, DREAM University is no ordinary educational institutional. Volunteer instructors and future professors are not out here teaching basic arithmetic – they are educating students on the history of immigrants, which is the history of the United States from Alexander Hamilton to the Chinese Exclusion Act to the other forms of discrimination that still exist against immigrants today. Perhaps the best part of the university is that it is open to all and a place for undocumented students to have fun while still learning new things. The highlight yesterday was a dance lesson sequence in front of the White House that made many onlookers stop and ask questions about the legislation. “We had a class on street theater and began performing the stories of our beloved immigrant communities. Finally, we took over the promenade between the park and the White House for a DREAM Act version of the Cha-cha Slide. No human dancing is illegal,” says Matias Ramos, one of the unlicensed professors at the university. DREAM U is a project of United We DREAM, a tactic to gain media attention for the DREAM Act while also building up to the national DREAM graduation on Tuesday, a performance event that is symbolic of the 70,000 young students who graduate from high schools each year only to find out that they are undocumented Americans and cannot go on to college or even adjust their status by joining the military. This is “cruel and unusual” punishment for hard-working kids who were brought here by their parents when they were very young and had no way of adjusting their immigration status. And contrary to popular perception, most undocumented youth cannot just apply for legal status – there is simply no line for them. The DREAM Act fixes this egregious fallacy in the law by giving qualified students a chance to apply for citizenship if they complete either 2 years of college or join the military. The fact that at least 2 million contributing young Americans are denied the right to equality of opportunity and punished for the alleged transgressions of their parents is entirely un-American. Congress needs to enact the DREAM Act into legislation as of yesterday. The legislation looks highly unlikely this year but stands a slightly better chance of passing as an amendment if the Democratic leadership–especially Senator Harry Reid who is locked in a tight race in Nevada and needs Latino votes–decides that it is in their best interest to make a down-payment on immigration reform before the mid-term elections.